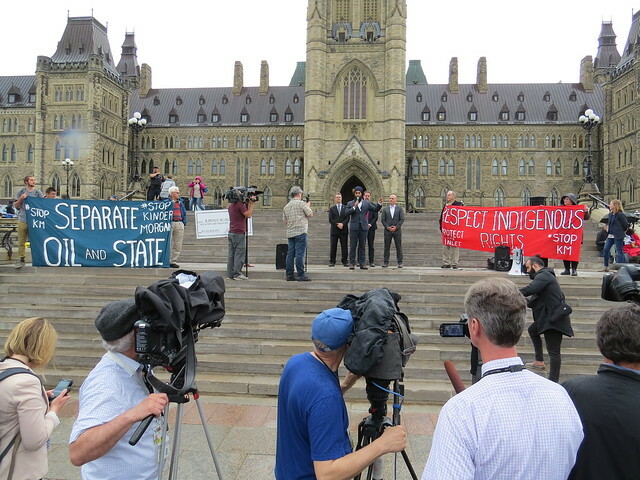 The Council of Canadians held a rally at Parliament Hill on May 22nd, 2018 to protest the Kinder Morgan pipeline and the federal government's plan to give the Texas-based company public money to secure the project's completion. As Kinder Morgan’s May 31 decision deadline for their Trans Mountain Expansion project approaches, Alberta Premier Rachel Notley and her NDP government are doubling down on how ardently they can support the pipeline. In addition to recent announcements that she will shut off oil exports to B.C, leave the federal agreement on carbon pricing, and skip key intergovernmental meetings like the Western premiers conference if the project continues to be stalled, Notley has been busy promoting the Kinder Morgan pipeline in a series of tweets, speeches, and interviews. Unfortunately her talking points are at best misleading and at worst patently false. The oil & gas industry and the federal government of course share responsibility for spreading misinformation about the pipeline, but it is still particularly jarring to hear it from a premier who campaigned on environmental leadership and a promise to uphold the UN Declaration of the Rights of Indigenous Peoples. Notley cited this statistic in response to federal NDP leader Jagmeet Singh speaking out at our May 22nd emergency rally against Kinder Morgan at Parliament Hill. Even after considerable research, it’s hard to tell what she is referring to. She may be suggesting that the project will “contribute to and support” (a) all 250,000 construction jobs that exist in B.C. or (b) each of the 250,000 jobs in all of Canadian mining, oil and gas, and logging combined, but either of these implications are laughable. The 250,000 number is larger than the usual (already vastly overstated) figure of 15,000 construction jobs that is a common feature of industry, federal government, and Alberta government talking points on the pipeline. The 15,000 jobs figure has already been debunked in detail by independent economist Robyn Allen here. Kinder Morgan’s own submission to the National Energy Board stated that the project would create 90 permanent jobs and 2,500 construction jobs for per year for two years (while some indirect job creation would be expected from the pipeline, it has not been reliably measured – you can read why here). It is worth underscoring that putting public money towards activities like renewable energy, transit, and reclaiming abandoned oil extraction sites is much more effective at creating good jobs (per dollar invested, these three sectors create between 4 and 15 times more jobs than oil & gas projects, as this 2016 Alberta Green Jobs report shows). And these kinds of investments would pave the way towards a fairer, climate-safe future instead of pushing us further down the wrong path. Notley is likely referring to a 2013 report from CIBC about the total cost to the Canadian economy of not having unlimited access to foreign markets for its oil – not just one pipeline. An updated 2018 report from Scotiabank puts the number at $10.7 billion, but even this has been shown to be about 10 times too high for not taking into account that few barrels from the oil sands are vulnerable to a price differential from lack of market access (discussed in more detail by Robyn Allen here). As with the jobs number above, Notley has used a dramatically higher number than the already misleading ones more typically cited by pro-pipeline parties, which are “$1 billion in added GDP a year” and “$50 billion in government revenue over 20 years”. These numbers come from a Conference Board of Canada study that uses a flawed modelling methodology that economist Trevor Tombe has joked is like saying "okay, let’s define all the costs as benefits and then double them." Mark Lee of the Canadian Centre for Policy Alternatives debunks the study's findings in detail here. 3. Implying Alberta’s oil sector represents close to 10% of Canada’s GDP. This kind of talk of course also obscures the bigger questions of whether the oil sands will continue to be in profitable a world that is transitioning away from fossil fuels, and why we are considering new fossil fuel projects when are already slated to overshoot our carbon budget. As Will Horter points out in the Tyee, rule of law is: “the principle that all people and institutions are subject to and accountable to law that is fairly applied and enforced.” Respecting rule of law would mean making sure the project went through a full and unbiased review process, which we know now was not the case for Kinder Morgan because the Trudeau government instructed public servants to make sure the review process ended in approval. Respecting the rule of law would also mean waiting for all court challenges to the projects to be resolved before beginning construction. It’s also worth considering the ethics of continuing to assert a Canadian legal system on unceded Indigenous territories. The Trans Mountain pipeline is a clear violation of Indigenous rights and our collective carbon budget, and Notley's claims of the project's benefits increasingly misrepresent the truth. Despite the commonly repeated idea that Notley's government has “no choice” but to push hard for Kinder Morgan to get re-elected, their strategy increasingly looks like a misstep. Why tie your government to a pipeline that looks less and less likely to go through? And why focus on selling pipelines better than Alberta’s right-wing United Conservative Party when you could instead outflank them on the many other issues (healthcare, education, economic diversification) Alberta's voters care about? How to take action: As we prepare for Kinder Morgan’s May 31 deadline for a decision on whether to proceed, remember that you can help by sending a message to telling Trudeau to respect Indigenous rights and BC's no to Kinder Morgan.